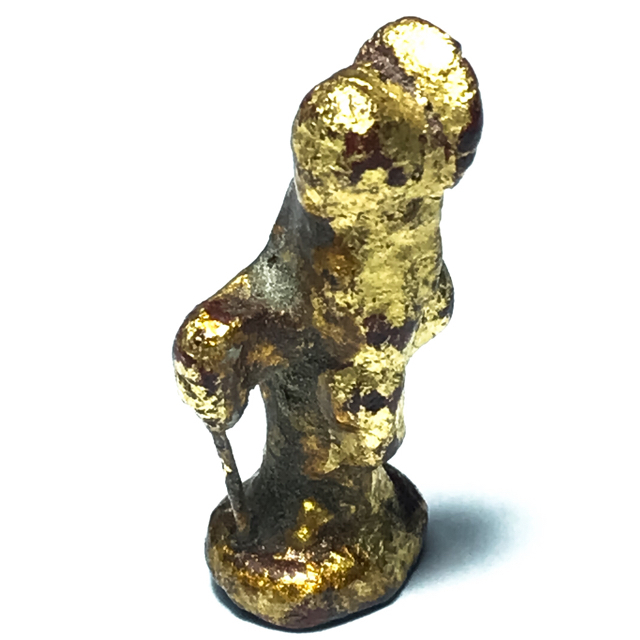 Pra Sivali Maha Thera Pim Dern Dong (rare walking through the forest posture), from the Ancient Pra Kru hiding place amulet find; the Pra Sivali Maha Thera amulet, is made from Nuea Pong Long Rak Pid Tong (Sacred Powders with black herbal Laquer and Gold coating). 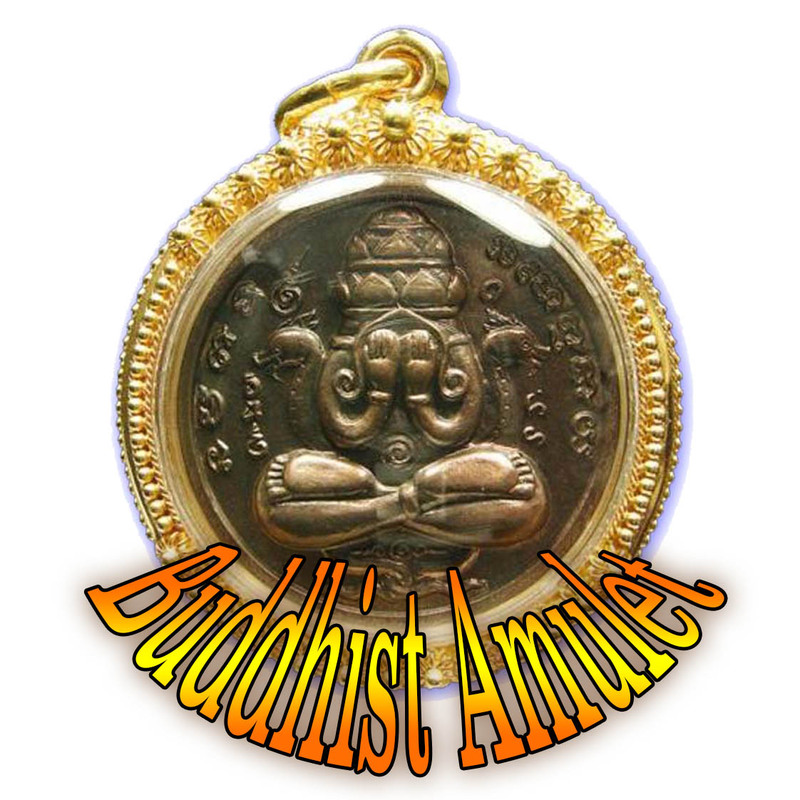 The amulet is empowered with a piece of Sacred 'Mai Gai Gug', magical wood inserted into the base. A highly Sacred amulet from the Kru Wat Chana Songkram Archeological Find of 2495 BE at the temple of Wat Chana Songkram in Banglamphu. The Kru Wat Chana Songkram find was discovered in 2495-2496 period; Tan Jao Khun Pra Tamma Pidok (Luang Por Niyom) gave the order to build a school for the local needy folk within the temple enclave of Wat Chana Songkram. He donated some land from the temple for the Ministry of Education to build the school. In order to make the area clear for the construction, it was necessary to remove the old Chedi Relic Stupa which was obstructing the vicinity where the construction was to take place. As the Chedi Stupa was disassembled, Luang Por Niyom (abbot of Wat Chana Songkram) instructed Tan Jao Khun Pra Wimon Gijjaraks (Luang Por Siri Adtramo), who was in charge of shrine preservation, to go into the Chedi to investigate within, to see if there were any hidden relics. Luang Por Siri reported to have found amulets made from Sacred Earthen powders, in small quantities, mostly broken, and that the larger number of unbroken amulets had already been plundered at a previous date by robbers.However, behind this Chedi Stupa, was another old Chedi, which was a larger one. They drilled through neck of the Stupa, and found a batch of the same kind of amulets which had been found in the first Chedi Stupa. The Samanera Novice Monks were called to enter and gather all the amulets from within the Stupa, and bring them out to be counted. Apart from all the various models of amulets which were brought out, a Sacred Bailan Parchment Scripture was also found, with Khom Sanskrit Agkhara Inscriptions on it. A carved wooden Buddha statue painted with lacquer and gold leaf, and some Pra Kru Wat Takrai Hnaa Krut amulets (Earthen Ayuttaya Era hiding place amulets of immense fame), were also found within the Kru Chamber of the Stupa. There were also some Pra Kone Samor Ayuttaya Era clay Buddha images, some and some Pra Chai. The Ministry of Buddhist Arts came to investigate and authenticate the artifacts, and concluded after perusal, that all of the amulets were placed within the Kru during the time of the Reign of His Majesty Rama 1 of the Chakri Dynasty, and that they had been ordered to be hidden there by the Grom Pra Rachawang Boworn Maha Surasihanat (A Royal Family Member ) to preserve Buddhism by leaving hidden amulets to be found in future times. They were ordered to be hidden in Kru Chamber, along with the construction of Wat Chana Songkram. This was on the grounds of the previously standing Wat Klang Na, as a way of makiing merits for Buddhism, to reduce his bad Karma from the decades of warmongering with the enemy nations. Grom Pra Rachawang Boworn Maha Surasihanat (2287 BE - 2346 BE) spent many years fighting to protect Siam against the enemy invaders, and fought on land with the army, as well as on boats with the navy, and was involved in much Killing. And so the temple of Wat Chana Songkram was built up, and the Chedi Stupas were filled with amulets, to make merits to atone for the deeds of war. The temple is called 'Wat Chana Songkram' meaning 'Victory of the War' which celebrated the many victories he had fought in. Once the amulets had been all gathered and safely counted, they were separated into their respective types. It is said that the most beautiful of all were the Pra Pid Ta and the Pim Samati Khad Paetch meditating Buddha. A large number of other very beautiful amulets were also found, including some golden Muan Sarn Sacred Powders amulets,; the Pra Upakut (Bua Khem), and this beautiful Pim Pra Sivali, which was found in two versions (sitting with almsbowl and standing with umbrella and shoulder bag). 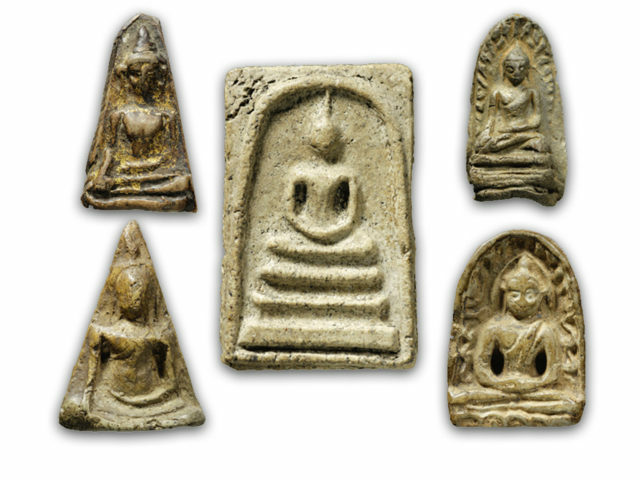 Below, some of the Pra Kru Wat Takrai Pim Hnaa Krut ancient amulets, some of which were found within the Chedi of the Kru Wat Chana Songkram in the same find. Pra Sivali is one of the Important Arahants in Thai Buddhism, along with Mokkhallana, Saributra, and Pra Upakut (Bua Khem) all of which are believed to be summonable using Chanted Invocations. Pra Sīvali (Thai: พระสีวลี - Chinese: 尸婆羅) is an Arahant widely venerated in South-east Asia. He is also, due to his reputation for always having good luck in receiving alms, even on difficult journeys in the wilderness, considered to be the guardian saint of travellers, someting like St. Christopher in the Christian Faith. Pra Sivali is believed to ward off misfortunes at home such as fire or theft. His veneration predates the introduction of Theravada Buddhism into Burma. Sīvali is typically depicted standing upright and carrying a walking staff, an alms bowl and Buddhist prayer beads. He is also seen to be figured in seated position eating from his almsbowl. Born to Queen Suppavasa, Sīvali is believed to have remained in his mother's womb for seven years because of past Karma. "May Nang Subpawaasaa of Goliya city be happy, and free from illness, and give birth to a son who cannot be found to have any blemishes or illnesses". Because of the power emitted by the great merits and purity of the Enlightened One, his words came into effect and became truth - the pain that Nang Subpawaasaa was experiencing diminished, and she gave birth to her son easily with no setbacks or suffering. Pra Sivali came into the world out as easily as water poured from a kettle. The Nobles of the Court gathered and decided on a name for her Princely son, and gave him the name of "Sivali Kumara" (Pra Sivali Gumarn, in Thai). Once Nang Subpawaasaa recovered physically, she decided she wished to make banquet offerings and reverence for a period of 7 days to the Lord Buddha. She sent her Swamis to go and invite the Buddha and the company of Sangha to come to the palace and receive offerings and reverence. The invitation offered them to come and stay the whole 7 days. Although he had just been born, Pra Sivali's body was already as strong as a seven year old boy, and he helped his mother to prepare and arrange the banquet offerings, and to filter the water for the monks to drink safely. As Pra Sivali was helping his mother and father to do this, the great Arahant Pra Saributra Thēra was watching the whole time. Pra Saributra took a great liking to Pra Sivali Gumarn, and when the seven days of reverence offerings was over, Pra Saributra approached Pra Sivali Gumarn and invited him to come and ordain as a member of the Sangha. It happened as the Lord Buddha and the Sangha went to visit Pra Rewadta, the younger brother of Pra Saributra, who was residing in a forest of Dtakian trees Dtakian tree is known as 'Iron Wood' - Hopea Odorata) in English. Mai Dtakian is a Sacred Tree that is believed to have a spirit of a female ghost inhabiting it, called 'Phii Nang Mai Dtakian'. There is hardly a temple in Thailand which does not have a Dtakian tree; normally you will see colored cloths wrapped around the trunk, as is the case with all sacred trees in Thailand. Powder from the wood of the Dtakian is used to make 'Pong Mai Dtakian" - a sacred powder used in amulet making. •	The first time he shaved his hair and observed the dead tissue falling to the floor, seeing that it was not self, he was enlightened to become a Sotapanna (Pra Sodaban in Thai). •	The third time he shaved his hair and observed the dead tissue falling to the floor, seeing that it was not self, he was enlightened to become a Anakami(Pra Anakami in Thai). After he was ordained it became noticed that Pra Sivali had much Laap Sakkara (fortune and honor from others), and this charming energy was even radiated and passed on to others around him. This became so apparent, that the Buddha would often seek out Pra Sivali to accompany him and the Sangha on long journeys, for it had been seen to be true that when Pra Sivali was present on such journeys, the Sangha would never have to endure any hardships looking for safe havens to stay in and find offerings of food. On the contrary in fact, when Pra Sivali was present on journeys, they would always meet with plenty of offerings and accommodation, and never have top do without food and sustenance for long. An example of this is the time that Lord Buddha and five hundred other Bhikkhus had to rely on the Laap and Baramee of Pra Sivali. As they had traveled a while, Pra Ananda Thēra (Pra Aanon in Thai) raised the following discussion and question; 'Reverend Lord, there are two ways we could travel, if we go this way, the path is full of small settlements along the way and the Bhikkhus will have plenty of safe places to rest where they will not have to suffer hunger, for the people along the way will make Bucha offerings. "My Dear Ananda, is not Pra Sivali Thēra with us?" "Yes my Lord, Ananda replied "Pra Sivali Thēra is with us"
Then the Buddha spoke again; "Dear Ananda, do not worry about what will happen when we take the shorter path through the forest, for the devas and spirits which inhabit the forest will lay out the necessary places and arrange for the Sangha to have a place to rest and replenish their energy along the way" "They will do this because Pra Sivali is with us and is the object of their respect and reverence, so we shall abide and reside in the merits. (Say in your heart) “May the magical powers of luck and fortune of Pra Sivali Thaera be installed within my perception, mind and body. As Pra Sivali was often a safe refuge for the Buddha, the Arahants and the 4 thousand Dhamma Khandas, thus so shall Pra Sivali Thaera be my refuge. May his immense power of Metta Mahaniyom and Choke Laap Saggaara generate riches and good fortunes in life, For absence of material things leads to physical suffering and plight”.